There's no better way to start the day, especially a cold winter morning, then with a hot stack of delicious pancakes, topped with real Vermont maple syrup! This gift box contains an 8 oz. bottle of 100% pure Grade B Vermont Maple Syrup, along with a 1 lb. pkg. 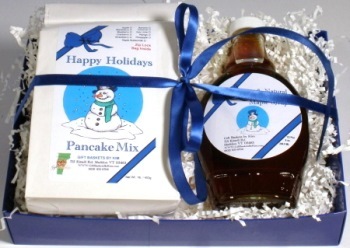 of our very own Northern Harvest pancake mix (select below) - Blueberry, Cranberry, or Maple Buttermilk. An easy pancake recipe is included. 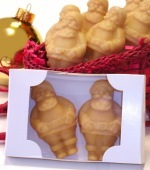 The gift box has a winter snowman theme with snowman labels, blue ribbon and 2-piece gift box. Re-boxed and shipped Priority Mail, it's a wonderful Vermont gift. Satisfaction Guaranteed. 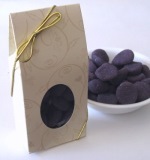 Pancake Mix: N. Harvest Blueberry Pancake Mix, 1 lb. pkg. N. Harvest Cranberry Pancake Mix, 1 lb. pkg. N. Harvest Maple Pancake Mix, 1 lb. pkg.